Yes, I did announce my return within my last post but that was just wishful thinking. Greta wasn’t fully recovered yet and as her health rebounded, so did her energy level. Let me tell you: she is one high-spirited dog! It was a good thing that her quarantine ended when it did (August month-end) because our daily walks were doing little to tire her. We have since become regulars at the area’s 4 dog parks. We go to 1 of them daily, weather permitting — although we have been rained upon a few times. Once there, she runs and runs, sometimes with other dogs and other times away from them. No matter. She’s running and that’s all that counts. This “fix” may be short-lived, however. Winter is coming and I’m not sure what I’m going to do once the snow falls. Does Craigslist run ads for second-hand dog sleds? Greta running laps in my yard and 1 reason why we visit a dog park daily. Now to the business at hand. It is Columbus Day, after all, and I couldn’t let the holiday pass without sharing something from the Kitchens. I may not have shared much lately but I’ve stashed away a number of drafts in varying stages of completion. Best of all, most have photos ready and waiting. All I need do is write an opening, like this one explaining my need to write an opening. Easy peasey! So, I chose this asparagus ravioli recipe for today’s holiday posting. It may not have been served at my family’s table but it sure has graced my dinner table a number of times. I really enjoy goats milk and it works quite well here with asparagus. Add a bit of prosciutto to the mix and you’ve got a great ravioli suitable for any holiday meal. Then again, why wait for a holiday? As I have done in the past, this is the recipe for the ravioli filling only. 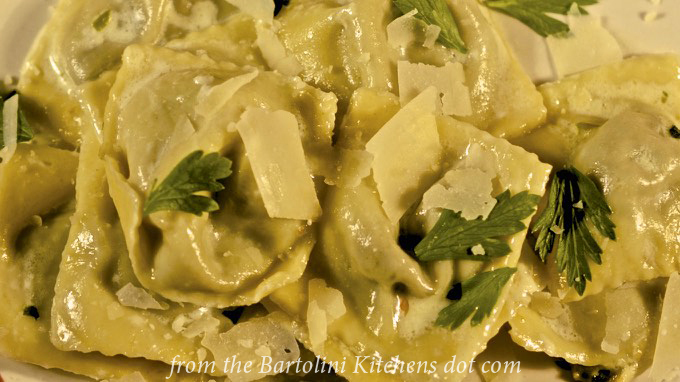 You can learn how to prepare the ravioli in my post Ravioli dei Bartolini. With it, you’ll be making ravioli like a Bartolini in no time. Heat butter and olive oil in a sauté pan over med-high heat. Add shallots and sauté until soft, about 4 minutes. Reduce heat to low, add prosciutto and asparagus, and slowly sauté until asparagus is soft and much of the liquid has evaporated from the pan. Do not allow prosciutto to burn. Set aside to cool. Once cooled, add the asparagus mixture to a food processor bowl. Process until chopped. (Alternately, finely chop the ingredients.) Add the basil, egg, Parmigiano, and goat cheeses to the bowl and process until the mixture is well-blended. Refrigerate for several hours or overnight before using to fill ravioli. See Ravioli dei Bartolini for detailed instructions for making ravioli at home. Although it isn’t necessary, I find that adding an egg to the filling gives it a better consistency when cooked. For serving, I’ve never used a red sauce to dress these ravioli, preferring a brown butter or cream sauce instead. I am aware that asparagus season is long gone for those of us living in the Northern Hemisphere. Blame Columbus. He should have timed his arrival with fresh asparagus in mind. In any event, although it may be too late for us, this recipe is right on time for our friends in the far South. Buon appetito! What if you don’t like goat cheese but still want to make ravioli with asparagus? Not to worry. I’ve got you covered. 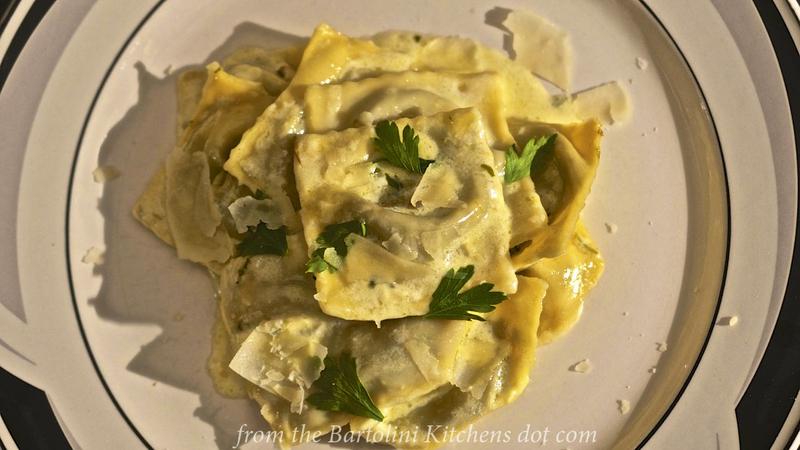 Check out my recipe for asparagus ravioli using ricotta instead of goat cheese. Just follow this LINK to see the recipe. This entry was posted in Home-Made Pastas, Pasta/Rice/Soups (Primi Piatti) and tagged Cheese, Cooking, Food, Goat Cheese, Italian, Pasta, Recipes by ChgoJohn. Bookmark the permalink. Lovely recipe, John! Will definitely be making this soon. Glad your girl is feeling better! Wow, this looks spectacular! Thanks so much for sharing. Me thinks you gonna need a treadmill for sweet Greta to get her through the winter months of no park visits. Love the shot of her zooming past at high speed. Glorious recipe too, then again, all your recipes are. Have a beautiful and happy week. Spring has finally shown her warm face so I will be in the garden for the est of the day. Where would European food be without Columbus? As usual, perfect ravioli – I wish I was eating that for lunch! Love the shot of Greta running. And I’m very glad she is doing better! As for winter…boy, I don’t have any suggestions. And Your winters are HARSH! What a beautiful dish, John. I can almost taste it now! I love asparagus and goat cheese–both–so much that this is a must! I can’t make it tonight but I’m now craving ravioli and will have to figure something out! 🙂 I love the photo of Greta the blur! How funny she is! I must say I’m curious about how this is going to work during the winter. I foresee a doggy parka and doggy boots! What a moreish and elegant dish: have always been crazy about asparagus, in season here, and love goat cheese so the first opportunity will see this tried 🙂 ! Currently on Australian TV we actually have an ad of a guy on the phone asserting to the party at the end of the line that ‘the dog’ has been taken for a walk . . . and there is pooch merrily running on a treadmill in the living room ! Not joking: perhaps all the readers advising you to get such apparatus just may have a point ! And a parka and boots sounds good also, Daddy . . . .you’ll work it out . . .
OMG this makes me hungry. Lovely combo. Bonjiourno John! Loving the idea of the dog sled. You could certainly ride in style. Perfect little pillows of delicious ravioli. So tender and delicious and a delicious browned butter to serve sounds fabulous. We completely understand the writers block. The part that we always find difficult is forming that perfect relationship with the reader that is also SEO friendly. Wishing you a super week. Oh Greta is adorable! I have trouble getting pics of our dogs as well. Usually it’s a blur. Lovely recipe to boot! A lovely recipe John. We suffer the same sort of exercise problems with our hound. She insists on being taken out at 3:30 every day. One can get no peace from that time until when one gives in and goes out. I haven’t had homemade ravioli in quite some time. Thanks for the recipe! John, such a delightful recipe; the first of the organic asparagus arrived this week! Your beloved Greta sounds such a character; you have so much joy in each other’s company. Whoa! That Greta is a firecracker! I bet she has a wonderful life with you. As for the recipe, there can never be too much asparagus in life, in my opinion. I have a sister who makes fabulous ravioli. I might send her this recipe with a big “Hint Hint” attached. I can’t believe I missed this delicious looking post. Your ravioli is always so delicious looking, nice and plump! Goats cheese all the way, particularly with asparagus, so tasty together. John, I’m not sure how I missed this one but I did. As asparagus season is just around the corner over this way the timing is perfect. I shall be making your Asparagus with Goat Cheese Ravioli as soon as our sparris come out of the ground.